Who gave up Puli for Vijay? When director SJ Suryah wanted to repeat the Kushi magic, he planned to direct Ilayathalapathy Vijay again for a movie titled Puli. Things didn't fall in place and both went on with their respective projects but the title remained with SJ Suryah. Years later, came an occasion where the director turned music director had a chance to show a small gesture. Team Vijay 58 was on a title hunt for their on-going project with Vijay when the title ‘Puli’ came up for consideration. As the title was with S J Suryah, the team approached him for the same. 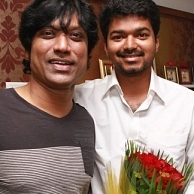 Our sources say that SJ Suryah was more than happy to give away the title "Puli" for his fellow friend Vijay. Suryah also said, Vijay is a dear friend who was gracious enough to attend the Isai audio launch. Their relationship dates back to the Kushi days and this is just a token of mutual respect between the two. Thanks to SJ Suryah, a roaring title for Vijay's next project! Maanae Thenae Peyae is half done! I is already a HIT ! When is Muni 3 releasing? Ilayathalapathy Vijay - A Philanthropist ! People looking for online information on Ilayathalapathy Vijay, Puli, Simbu devan, SJ Surya, Vijay will find this news story useful.